Twenty years on from releasing their landmark Mezzanine LP, Massive Attack have announced plans to give the album the reissue treatment. The remastered reissue will arrive as both a coloured 3-LP vinyl box (out December 7) and 2-CD set (out November 16). Both editions will include previously unheard dub mixes by Mad Professor, recorded during the original album sessions. 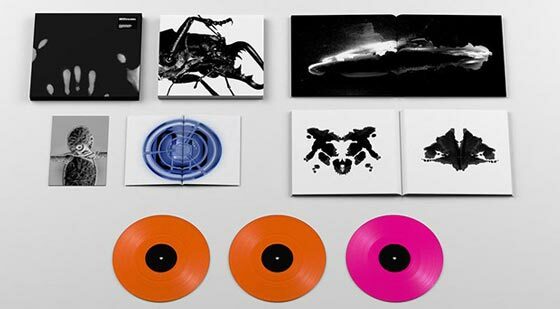 The vinyl box set will also include a book of exclusive images from the group's Robert "3D" Del Naja and Nick Knight. It will be housed in a heat-sensitive box, with the above image giving listeners an idea what happens when the packaging is exposed to heat. Both editions of the reissue can be preordered here. Earlier this year, the group reissued Mezzanine on DNA (yes, really). Del Naja also co-produced a new single for Neneh Cherry. Neneh Cherry Teams Up with Four Tet and Massive Attack's 3D for "Kong"